The Windsor Norfolk Double Door Shed is built with affordability and quality in mind. It comes with a very attractive, solid construction and is one of the larger sheds available. This means it provides a generous amount of space to store anything you might need to such as garden furniture and equipment. There are 4 fixed windows attached to one side of the shed. You can choose to install this window panel on either side of the building. As they are fixed, you gain a great level of light inside the shed, without the security worry that comes with opening windows. Large double doors open out to allow you extremely easy access into the shed. They have a ledge design and they are pad-lockable, though a padlock isn’t actually supplied. Built with 12mm Shiplap tongue and groove, a 10 year anti-rot guarantee is supplied. However, this is dependent upon annual treatments. The OSB interior helps to keep the costs down whilst providing more strength than Plywood. However, you still might find it beneficial to add your own bracing to the floor if you’re planning on keeping heavy storage. 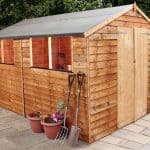 All in all this is a fantastic value shed that is guaranteed to last for years. If you’re looking for both quality and affordability then this is one of the best models to consider. OSB floors aren’t the best choice for heavy storage. However it is possible to add a thicker solid sheet board to improve its strength if necessary. 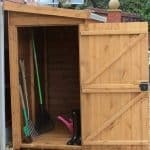 This is a large, great value storage shed, capable of storing all kinds of garden furniture, tools and equipment. What’s interesting is that no measurements are given for the door. If you look at the picture however, you’ll see that the doors reach right up past the eaves. This makes them stand out more and become a prominent feature of the building. It has an impressive height which ensures you can store really tall items easily. So if you own fishing poles or golf clubs for example, this would be a great place to keep them. The floor and the roof are both constructed with OSB materials. This isn’t as strong as tongue and groove, but it is stronger than plywood. So you’re getting a medium strength support. The roof has an apex shape which is what provides the interior height benefits. It also boasts excellent rainwater resistance, draining it off the roof quickly to prevent problems such as fungus and rot developing. The only thing we will say about the floor is that whilst it does offer a stable and solid design, it isn’t overly good at accommodating heavy storage. So if you have any heavy machinery or furniture that you need to store, we’d advise you to strengthen it by adding extra bracing. The walls of this shed are 12mm thick and created with Shiplap tongue and groove cladding. This is the best form of cladding used on wooden buildings and it offers a very rigid and weather-proof design. The walls have an interlocking construction which prevent water seeping through to the interior, as well as eliminating drafts. It isn’t likely to warp like overlap will either, though to accommodate for any changes in the timber, an expansion gap is built into the cladding’s design. Inside the building the frame measures 27mm x 32mm which is a little thicker than standard. Whilst Shiplap is naturally more weather resistant than overlap, it still requires treatment to keep it well protected. A high quality spirit based treatment is recommended, but water based preservatives will still offer effective protection for up to a year. There are also more colour options with water based treatments so if you’re looking to customise the shed, the water treatments offered as extras are highly recommended. 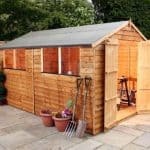 If you treat the shed every year, you’ll benefit from the sheds great 10 year guarantee against rot and fungus. Double doors are included, but as you’ll see from the picture they aren’t quite as wide as those found on many of its competitors. They still reveal a good amount of access, allowing you to transport bulky, large machinery and furniture. They aren’t braced but they do come with a ledge design and they are hinged for added durability. They can also be padlocked, though you will need to buy a padlock separately. There are four styrene glazed fixed windows included. You can install these on any side of the shed thanks to the interchangeable design. The main benefit of a fixed window is that it offers light into the building without compromising security. With opening windows there’s a small chance that a thief could try to climb through. This shed has the potential to be very secure if you add a padlock. Its strong walls prevent anybody breaking through the actual timber. The only thing you might want to change is the privacy of the shed. As it features four windows, the entire storage area can be viewed from the outside. The fact they are fixed does provide more security and the styrene glazing is harder to break than glass. However, if a thief spots something valuable in the building they could still decide to break in. Adding blinds or curtains behind the windows will help cover your storage at night and when you aren’t at home. There are two obvious ways to customise this shed. Firstly you have the choice of whether to install the windows on the right or left side of the building. This offers more than an aesthetic benefit; it is also a practical option too. As mentioned earlier you can opt to install the windows on the more private side, helping to make your storage more secure. It also gives you more options in terms of where you want to actually install the shed. The other way to obviously customise the shed is via coloured treatments. You are given four different options under ‘extras’ including Red Cedar, Ivy Green, light and dark brown. These treatments are 100% environmentally safe. 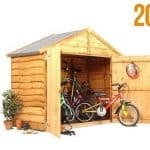 Not only will you be changing the colour of the shed, you’ll also be keeping it protected. If you don’t have a large concrete area to install the shed, the Portabase DIY Timber Base Kit is a worthwhile investment. It helps to ensure the shed is built on top of a sturdy, even surface. Though it is pretty easy to install, you can choose the optional base installation service to speed up construction. You also have a separate professional installation service for the actual shed. If you’re not a big fan of DIY then this service is definitely for you. A team will come and erect the building for you, leaving you free to simply use it. Finally you have a DIY Assembly Assistance kit available. This isn’t really essential as it simply contains all of the tools you might need to put the shed together. If you’ve done a lot of DIY you’re likely already going to have the tools available. 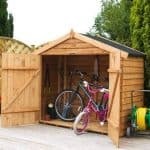 This is a fantastic quality storage shed that offers a safe place to store anything from tools to garden furniture. The exterior cladding is guaranteed to last at least 10 years providing you treat it right. The longevity of the interior however will depend upon what you choose to store. OSB isn’t as strong as tongue and groove so heavier storage may cause some stability issues. This can be improved however by adding bracing or an additional solid sheet board. Being a larger storage shed, it offers an exceptional storage capacity. You can also add your own shelving and hooks to further enhance its capabilities. 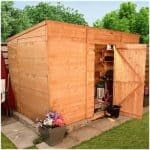 How easy you find this shed to assemble will very much depend upon your DIY experience. Most customers have found it easy to install, whilst others have found it a little tricky. You are supplied with all instructions and if you are worried you can always pay a little more to have it installed for you. Taking into account the size and high quality design of this shed, you are provided with brilliant value for money. It requires minimal maintenance and comes with some great features that make it well worth the money paid. 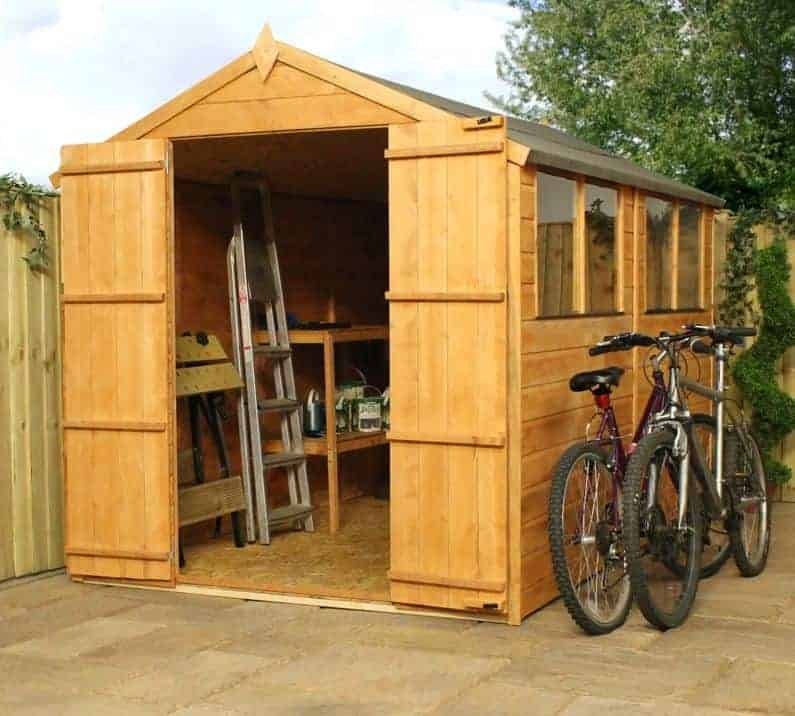 Final Thoughts: The Windsor range of sheds are known for their great value for money as well as quality construction. This one is a large storage shed, built to store a wide range of items. 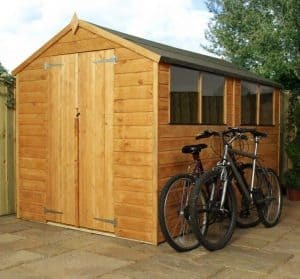 Made with 12mm tongue and groove Shiplap cladding, it has a strong and sturdy build that is capable of withstanding the unpredictable British elements. 4 fixed styrene glazed windows, large double doors, a 10 year anti rot warranty and a tall, spacious interior make this shed one of the best entry-level models on the market. Annual treatments are necessary, but overall it provides you with excellent value for money.